Wolverton got their season off to a winning start in Cherwell Division 2, brushing aside Bledlow by six wickets. Glenn Dickinson and Atif Akhlaq both took three wickets as the home side removed their opponents for 160 from 45.1 overs. 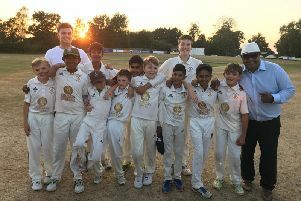 Despite losing opener Chris King without troubling the scorers, Akhlaq formed a strong 116-run partnership with Sean Potter to put the hosts in control. Akhlaq fell just shy of his half-century on 49, while Potter finished unbeaten on 65. Michael Yeates joined Potter at the crease and finished 35 not out as Wolverton (164-4) cruised to victory. In Division 3, Chris Jones’ 50 wasn’t enough to guide Great Brickhill 2nds (131) to victory over Banbury 3rds (164-5). In Division 4, Bletchley Town (88) were well beaten by Thame Town 2nds (119) despite Zulfiqar Ahmed’s 4-20. Wolverton 2nds (208-7) had to settle for a draw in their Division 5 clash with Bledlow 2nds (224-8), with David de Abreu scoring 61.